The Medifast weight loss program is a great one for those that want to lose weight quickly through meal replacement. While on the Medifast program, participants have five meals that are all prepared by Medifast, and in addition, one daily ‘Lean & Green’ meal. The Lean & Green meal consists of five to seven ounces of lean protein, three servings of vegetables, and up to two healthy fats, depending on your lean protein choices. Dieters can choose to have their Lean & Green meal at any point during the day and can also divide it up into two different portions and eat half of it at a time. Some tips for choosing your lean portion of the meal include meats that are grilled, baked, broiled or poached – but nothing fried. Also strive to eat at least two servings of fish per week that are rich in omega-3 fatty acids. Some of the seven-ounce options for the lean portion of the meal include fish, shellfish, game meat, ground turkey or any other meat that is 98 percent lean, or meatless options like egg whites and egg beaters. All of the seven-ounce protein options can have up two healthy fat servings, if desired. If dieters want to go with six ounces of lean protein, they can also include one healthy fat. Those options would include chicken, fish, white meat turkey or ground turkey that is between 95 and 97 percent lean. Last is the five ounce serving of protein option. These proteins would include no additional fat. The available proteins for this category include fish, lean beef, lamb, pork chop or pork tenderloin, ground turkey between 85 and 94 percent lean, or dark meat chicken or turkey. With Medifast, the green portion of the Lean & Green meal offers several options as well. The greens are broken into lower, moderate and higher carbohydrate categories. It’s recommended that dieters avoid the higher carbohydrate vegetables until they reach their weight loss goals, in order keep their weight loss going. Things like collards, endive, lettuce, mustard greens, spinach, spring mix, watercress and bok choy are just a few of the acceptable choices for the green portion of the meal. 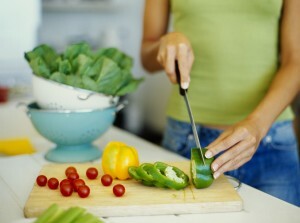 The following are a few different Lean & Green meals for those on the Medifast eating plan. The Medifast meal plan is a good option for those seeking to lose weight through a healthy diet with portion control. The Lean & Green options provide room for creativity, and are a great way to practice eating healthfully without the aid of a meal delivery system.